Review date: 27 February 2002. Well, OK. This problem hasn't really plagued humanity all that much. But it's still not easy to shift a PC from place to place. Ordinary PC cases aren't cripplingly difficult to schlep around, provided you don't have to move a stacked full-tower monster, and also provided you're not remarkably weedy. Given the seriously awful consequences of dropping your PC down a flight of concrete stairs, though, it's still not a bad idea to make the thing a bit more grabbable. A handle is nice. Monitors, especially large ones, are a much bigger pain to move. No handles, awkward shape, very heavy, easily scratched screen, results of tumble down staircase even more dramatic. Flat panel screens are more fragile than CRTs (LCD screens are sandwich of thin sheets of glass) but they're far, far lighter. All you need to make them quite easily transportable in the traditional back-of-a-car location is a sheet of thick cardboard taped over the panel to protect it. Unfortunately, large flat panels still cost a fairly large fortune, and you have to buy a large one if you want a monitor that's capable of the high resolutions that today's spoiled PC users demand. So, if you have to move your monitor, that probably still means you have to move a CRT. 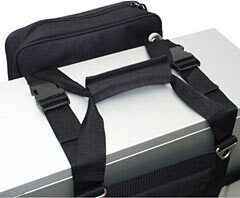 There are a few companies that make webbing harnesses that you can wrap around a computer case to give it a handle and/or shoulder strap; I've previously reviewed the $US34.95 CaseAce GearGrip Pro here, and the simpler but still perfectly adequate $US14.95 PC Tote here. 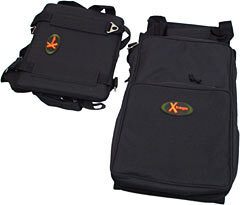 Now, here are a couple of new computer-gear-carriers from Xbags. One's for carrying mini-to-midi-tower PCs and is called the Case Transport Strapping System, or CTSS. 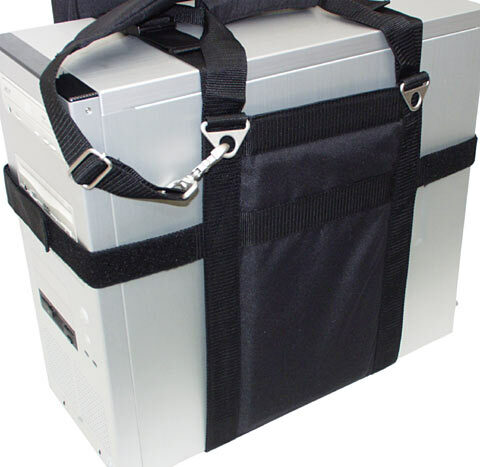 The other is for moving CRT screens, and is called the Monitor Transport Strapping System, or MTSS. Xbags also, by the way, make a "Weapons Transport Field Bag System" for paintball gear. Or for a couple of takedown hunting rifles, a bottle of amyl nitrate and a dozen hand grenades, I suppose; it's none of my business what you choose to take up that clocktower with you. Anyway, you can buy the CTSS and MTSS on the Xbags site (the order page is here). The CTSS is $US45.95, the MTSS is $US34.95; if you buy them both together they're $US75.90, which is five bucks off. So they're not dirt cheap, but they still don't cost much compared with the price of a PC. ...and the pivoting carabiners and the loops they engage are cast aluminium, with steel spring-clips on the carabiners. Cheap camping gear has webbing that frays, buckles that snap, and carabiners that break and/or open unexpectedly. None of that should be an issue with the Xbags. Oh, yeah. They've got great big rubber logo badges, too. It's easy enough to see what the deal is with the CTSS, once you unfold it a bit. There's a PC-shaped space. The same cannot be said about the MTSS. Unfold it and it just looks like a formless pile of webbing. 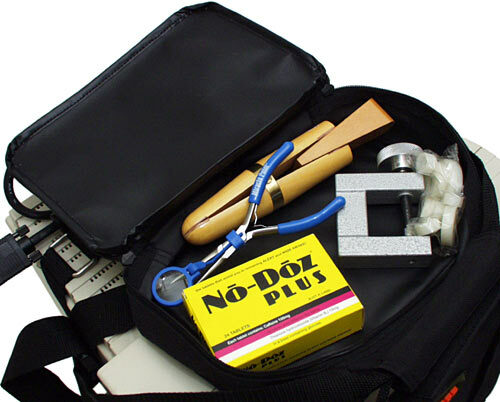 Neither Transport Strapping System, though, is particularly difficult to use. I tried out the CTSS by wrapping it around the Lian Li PC-65USB that contains my current main PC (written about here). Lian Li's PC-6x series cases are about as big as a midi-tower case gets; they're unusually wide and also quite deep, so any carrying gadget that fits one of these should fit any other midi-tower or smaller case. In brief: It works. It's pretty simple to attach and remove, too. Straps around the sides, top and bottom of a PC box are all that the other computer carriers I've seen use; tighten them properly and they're very secure. The CTSS, however, adds a pair of hook and loop straps (the Velcro company would rather you didn't call hook and loop material "Velcro" if it's not made by them). 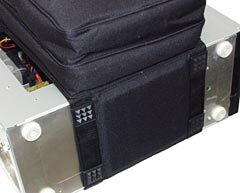 The straps go around the front and back of the case, and lock it very firmly into the harness. 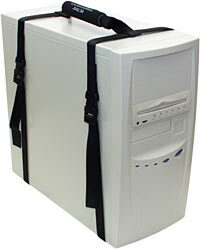 Simpler computer carriers that don't have these front and back straps let you use the machine without taking the carrier off. The CTSS is almost as easy, though; you just have to rip off the two hook and loop straps. 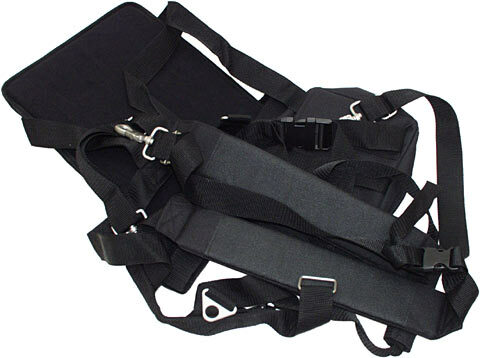 That only takes a moment, and the rest of the harness can stay in place. The handle on the top of the CTSS is another hook-and-loop arrangement. Unwrap the padded body of the handle and the two straps that make it up come apart, which makes it easy to get a computer into the harness. Then you clip and tighten the buckles on the top, wrap the front and back straps into position, reassemble the handle, and you're ready to go. You also get a carabiner-equipped shoulder strap with the CTSS; you don't have to clip on if you don't want it. I haven't been impressed with other shoulder strap PC carriers, because something this heavy and bulky just isn't easy to carry that way. It's easier to carry it by a handle and stretch your arm than to hang it off your shoulder and bruise your hip. 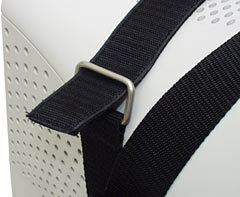 The CTSS shoulder strap has four possible attachment points, so you can clip it on diagonally across the top of the PC. This isn't an amazing ergonomic revelation, but it does make carrying a bit easier, I think. The strap's quite heavily padded, too, which is nice. The ordinary top handle is OK, too, though its two-part design means it tends to pull apart a bit while you're carrying the computer. The one-part handles on the GearGrip and PC Tote I looked at before are a little more comfortable. The other PC carriers, though, don't have these. 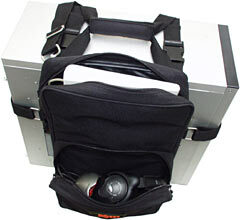 One side of the CTSS has two zip-up pockets, one for your keyboard and one for mouse, headphones, cables and so on. The keyboard pocket is capacious enough to hold a full size old model IBM keyboard, so whatever 'board you use is likely to fit. Both pockets are also padded inside and out, to reduce the chance of more parts coming out of them than you put in. 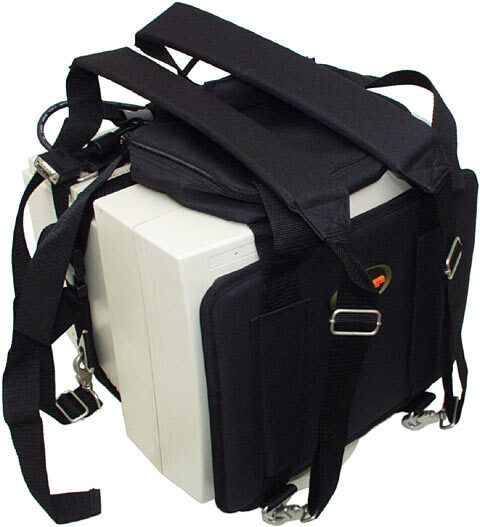 There's a polyethylene board built into the padded back of the keyboard pocket, between that pocket and the PC; it stops the pockets from going all floppy as you put the CTSS on the PC, and it also provides a bit more protection for the PC. The three padded layers of the pocket assembly would probably be adequate for that all by themselves, though. On the opposite side from the pockets, there's another padded plastic board plate, to protect the case from dings. There's no padding for the corners of the case, by the way. Your case isn't very likely to be seriously damaged if you swing it into your vehicle inaccurately and whack an unpadded corner on the car's bodywork on the way, but the same cannot be said for the car. The bottom of the CTSS has plastic feet to save it from scuffing, and another pad-plate. The three plates, between them, make it easy to locate your computer case in the CTSS, without tugging straps back and forth to get the handle on the top centred. On to the monitor carrier. The Monitor Transport Blah Blah Blah is supposed to work with CRT screens up to 19 inches in size, so I first tried it out on my Samsung SyncMaster 900SL (reviewed here). The 900SL is about as small, in overall dimensions, as 19 inch monitors can be. That's because it's got a short picture tube, which makes it a lot closer to cubic than many bigger screens. Generally, big monitors are considerably longer than they're tall; short-tube monitors aren't, which makes them easier to fit on a cramped desk. The trade-off here, though, is that the back of the 900SL is fatter than usual. Turn the monitor face down and put a belt around the middle of it and you'll need to use more belt-holes than you would with most 19 inchers. Unfortunately, as a result, the MTSS's rear compression strap turned out to not be long enough. 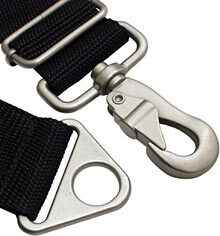 This is another hook and loop strap, and its total length is about 1.3 metres. But because it has to double back on itself for the hook and loop stuff to work, it won't fit monitors with a back-of-tube circumference above about 115cm (45.25 inches). You can attach the MTSS without using the rear strap - there are two other buckled straps that go around the front of the monitor and down the sides, joining up underneath - but it's not as secure that way. I wouldn't recommend it. The MTSS ought to fit any 17 or 15 inch screen OK, though. I didn't have a 17 handy, so I wrapped it around a 15. Here's the result. 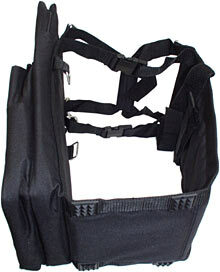 This is the full rig, complete with the two clip-on shoulder straps. Again, you don't have to use the straps if you don't want to, because there's another two-part handle as well. 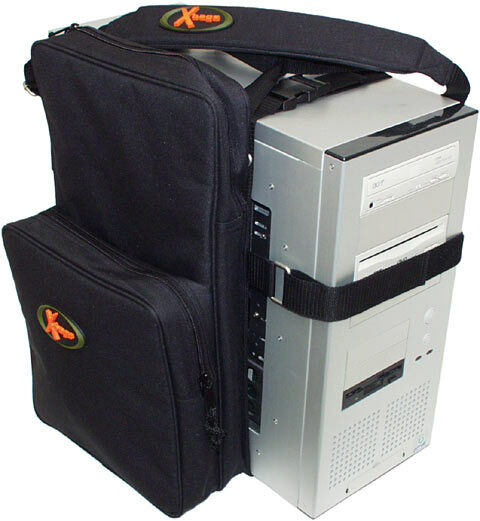 The shoulder straps, in this case, are there to let you use your monitor as a "frontpack" - holding it in much the same place it'd be if you'd just picked it up in the usual fashion, but with the weight taken by the shoulder straps instead of your straining arms and fingers. With a bit of strap-length tweaking, you can get the monitor positioned such that no part of your anatomy is unacceptably compressed, provided your abdominal dimensions aren't too unusual. ...when I can just rip one off from the Xbags site. Again, I wouldn't describe this carrying method as being an incredible paradigm shift in load-bearing technology, but it's much better than hand-carrying a monitor, and should significantly extend the distance you can lug a given CRT before you start embarrassing your friends by begging them to kill you. Oh, and it leaves your hands free, too. Another thing that you don't have to attach to the MTSS if you don't want to, but which you really ought to use if you know what's good for you, is this screen protector. It attaches to the front straps via a couple of flaps secured with more not-Velcro, and it's got another board-and-padding sandwich inside it. So not only will it stop you from scratching the screen with your belt buckle, but it should actually be able to protect the monitor from quite serious impacts. CRTs are made of thick leaded glass and are surprisingly strong, as anybody who's purposely tried to smash in an old screen by whacking the front of it will know. The way to break glass without scoring it beforehand, though, is with a sharp impact concentrated on a small area. Get the impact point small enough and you don't need a whole lot of energy to get rapid crack propagation happening. This is why automatic centre punches are so good at breaking car windows. A bit of padding over the glass of a monitor will spread impact forces enough that you could probably stand a brick on end and drop your monitor, screen down, straight onto the thing from chest level, without causing an implosion. If you try this and I turn out to be wrong, by the way, tough. All care, no responsibility. Contents may have settled during shipping. All models over eighteen years of age. The top of the MTSS has another padded zip-up pocket, in which you can put unremarkable LAN party essentials like the ones shown in the above picture. Note: There is no prize for knowing what all of these things are. The MTSS pocket is removable, but only by unbuckling everything and sliding out the straps. I like both of the Xbags. They're not terribly expensive, they're very solid, the pockets are handy, and they're about as easy to carry as one of these sorts of things can be. If all you want is something that'll put a comfy handle on a computer, then a PC Tote will do the job for a third of the CTSS's price. 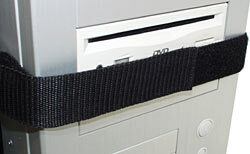 Or you can do it yourself, of course; various people, including me, have grafted handles of various sorts onto PC cases. If you don't want to take to your computer case with a power drill, though, the CTSS is attractive. The GearGrip Pro's not a great deal cheaper than the CTSS, and the thin GearGrip side pocket plus cable-holding loops aren't as good as the CTSS arrangement. 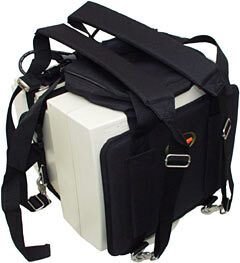 So if you're looking for a full-featured PC carrying thingy, the CTSS is probably the thingy you want. The MTSS is about as elegant as can be expected, too. It could do with a longer rear strap, but that's the only thing wrong with it. Personally, I just consider this to be the world telling me to think again about lugging a 47 pound 19 inch screen around. The 900SL's comparatively light for a 19 incher, by the way; flat screen models like the SyncMaster 955DF I review here weigh even more. 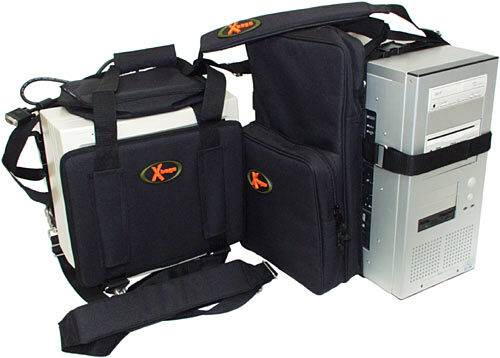 If you often need to move pretty much any medium sized PC and pretty much any 15 or 17 inch monitor, the CTSS and MTSS will help you get the job done with no - or at least with less - herniation and property damage. Recommended. 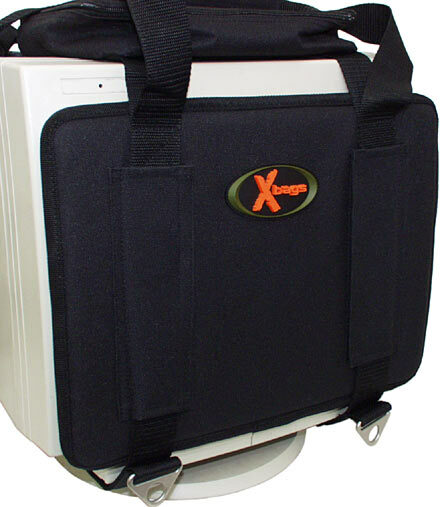 CTSS and MTSS kindly provided by Xbags.